On the video front, the band have created a high-energy clip for the album's title track, "When Legends Rise" which has been the #1 song at Rock Radio for four straight weeks. The video, which is being released in advance of this weekend's NFL Playoffs, mixes an electrifying live performance of the Boston quartet--Sully Erna [vocals, guitar], Tony Rombola [guitar], Robbie Merrill [bass], and Shannon Larkin [drums]--interspersed with thrilling highlights of pivotal moments in recent football history, concluding with a shot of the New England Patriots Super Bowl trophy. Watch the clip on KNAC.COM HERE. When Legends Rise is the second #1 from the album. It follows last year's #1 Bulletproof, which was just nominated for "Rock Song of the Year" for the 2019 iHeartRadio Music Awards and was also the most-played song at rock radio in 2018. The band was also nominated for a second award for "Rock Artist of the Year." WHEN LEGENDS RISE marks the band's seventh studio album and their first in four years. The 11-song collection entered the Billboard Top 200 album chart in the top ten (#8), with four #1 placements on other charts: Top Rock Albums, Top Hard Music Albums, Top Independent Albums and Top Alternative Albums. WHEN LEGENDS RISE is available on CD, LP and Digital. The album finds the guys doubling down on their combination of tightly wound riffs, rhythmic fury, naked emotions and pushed-to-the-edge vocals, all fired up with melodic precision and tight songcraft. Next month, GODSMACK return to the road, first with 20 shows in Europe to be followed by a North American headlining tour with VOLBEAT. The European swing gets underway February 27 in London with LIKE A STORM confirmed as direct support for the six-week European trek. 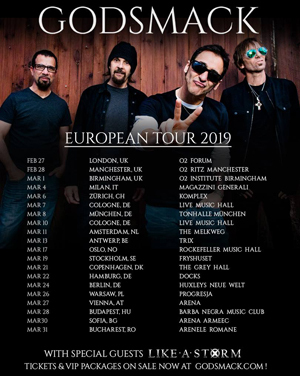 GODSMACK will then return to the U.S. where they'll headline a run of shows with special guests VOLBEAT, along with some co-headlining shows with them in Canada. Tickets for all the shows are on sale now.